Developer Quote: "We’ve separated Bejeweled Blitz from the Bejeweled 2 app so we can make sure every game update is 100% dedicated to Bejeweled Blitz so you’ll get faster updates and even more Facebook connectivity." Enjoy gorgeous retina display graphics. Connect and compete with your Facebook friends. Keep an eye on the high-score leaderboards and weekly tournament tracking. Boost your fun with Detonators, Scramblers and Multipliers. Match as fast as you can to earn Blazing Speed and blow gems away. Unearth rare gems for even more excitement. The elusive Cat's Eye adds brilliant laser-blasting action, and the Phoenix Prism brings fiery gem destruction. Take a turn with Daily Spin to stockpile coins for just the right boost. Awesome in-game sounds and music, creating an even more dazzling experience every time you play. 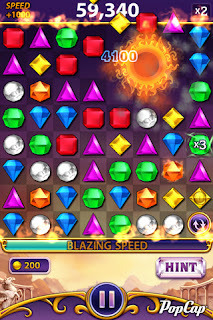 In this wrist flicking, finger tapping game, match and detonate as many gems as you can. Match 3 or more and create cascades of fun with Flame gems, Star gems and Hypercubes. In addition, increase your stack of Bejeweled Blitz coins with Daily Spin. This snappy quick game will have you fueled on adrenaline as you use your mind to find and create the sparkling bonus gems eliminations. 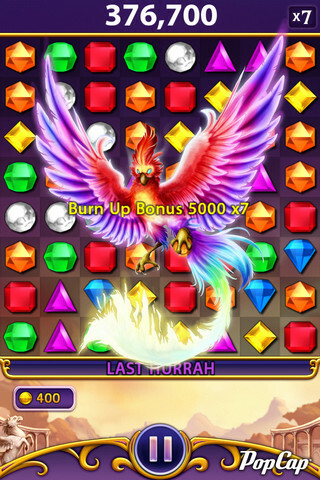 COOL CONCLUSION: "Bejeweled Blitz is a a gorgeous game classic that will dazzle you with rapid action and match-three fun!"